Very happy to see the catalogue to “Louis Kahn: The Power of Architecture” out, along with word of the exhibition opening at the Netherlands Architecture Institute in Rotterdam, where it will be until 6 January. The last blockbuster Kahn exhibition took place in 1991, which in hindsight seems relatively close to his death in 1974. This one, organized by the Vitra Design Museum and the Penn Archives, presents a much broader picture of Kahn and his work, and the catalogue, with ten essays by Kahn scholars, should become a standard reference. I was really happy to be invited to contribute, and the essay that I wrote for this deals with Kahn’s relationships with two engineers–August Komendant, who enabled most of Kahn’s masterworks by being a ruthless design collaborator and an energetic presence during construction, and Robert Le Ricolais, with whom Kahn taught throughout the 1960s and early 1970s. Le Ricolais provided a far more philosophical bent, and his neo-Platonic projects of “infinite span, zero weight” seems to have spurred Kahn on to some of his more metaphysical thoughts. But the two were also top-notch educators, and their development of advanced design studios–Kahn’s legendary architecture studio and Le Ricolais’ underappreciated experimental structures studio–defined Penn’s program for a generation. The show divides Kahn’s work into six themes–like the 1990s show, it forgoes a chronological approach. But the themes selected here are broader than they were in that show, which focused on civic and phenomenological aspects of Kahn’s work. Vitra, through curator Jochen Eisenbrand, has also included materiality and engineering as major themes, which is gratifying to see and makes for a better rounded and I suspect more interesting show. After its stint at the NAI, the show travels to the Vitra Design Museum in Weil am Rhein from March 23 to August 11, 2013, and it’s planned for a stint at Penn later next year. 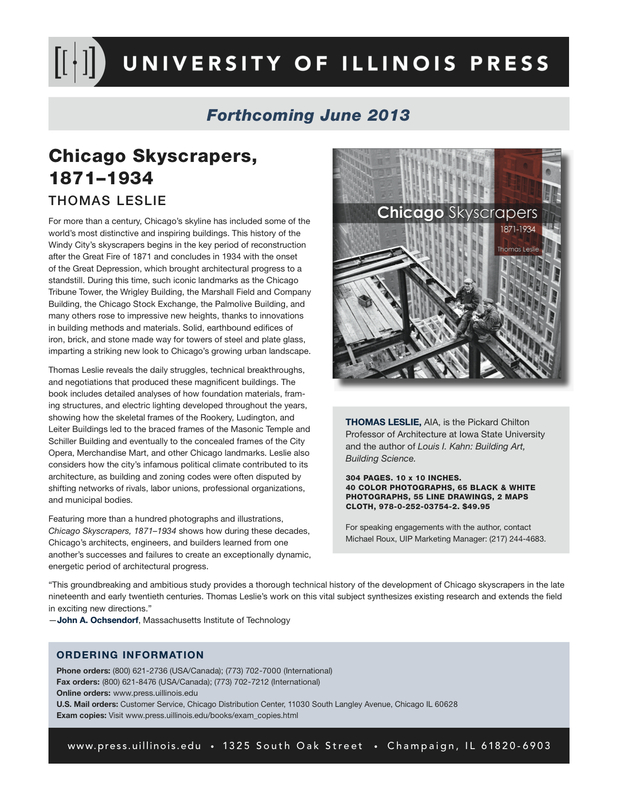 (full .pdf here: LeslieS13) Couldn’t be more pleased to post this–the publicity page from University of Illinois Press about Chicago Skyscrapers, 1871-1934, due out in June. The cover, featuring two ironworkers on One La Salle, is exactly right; the book is about how these towers were built, piece by piece, and how the labor and technology needed to go higher gives us an insight into not only the economics and culture of the time, but also the lives of designers, developers, occupants, and builders. The flyer includes contact information for lectures and talks, and we’re working on setting up a series of those after the book is out–I’m hoping that those two workers get to see some interesting places. …and many thanks to grad faculty and staff at the University of Tennessee for setting up a Kahn lecture in their grad tech program. Good questions and good fish tacos. 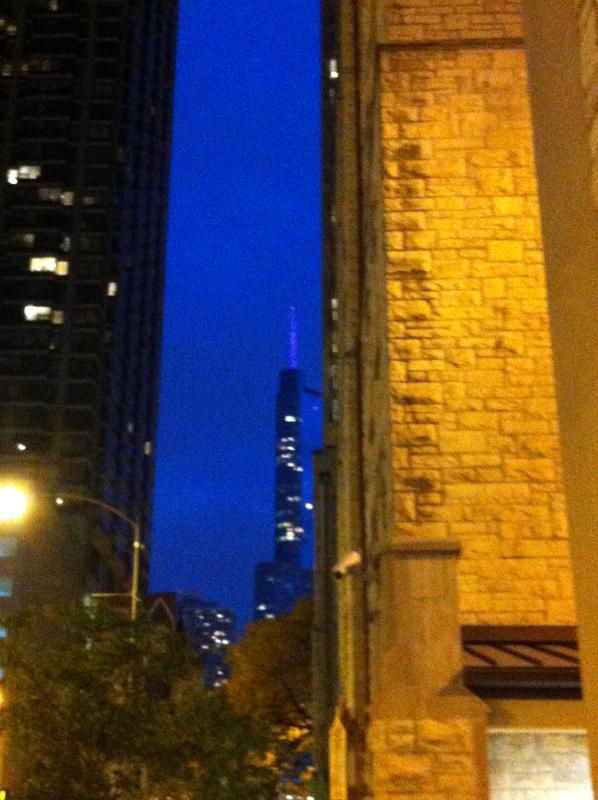 I’ve been in Chicago the last couple of days, though, interviewing postwar skyscraper engineers and architects. Not that there’s an official sequel yet, but what’s interesting to me (and, so far, to the folks I’m speaking with) is both how much changed between the 1920s and the 1950s–and how much didn’t. One constant theme has been that the relationships between owners, architects, consultants, and contractors were overwhelmingly collaborative then, and unconstructively competitive now. There’s a book in that alone. Good to check in at Northwestern, too, where I enjoyed the chance to give an annual (I hope!) lecture to the CEE department’s special architecture sequence. Genuinely interesting stuff going on there, as always. You are currently viewing the archives for October, 2012 at architecturefarm.